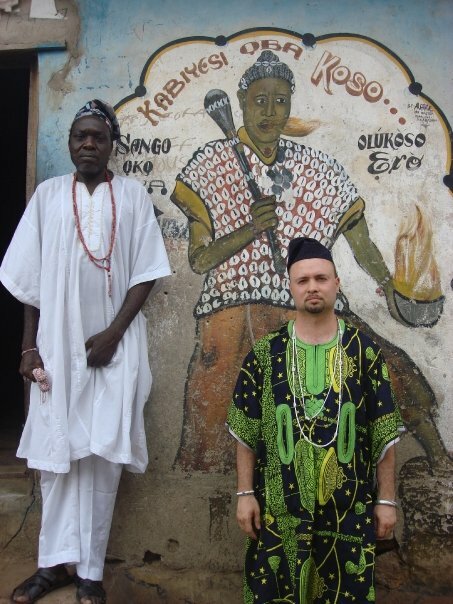 This is an interview with Nathan Lugo Olóyè Àìkúlọlá Olúwin-Òòs̩à, who is a practitioner of the West African Òrìṣà tradition. He was initiated into Ifá, Ọbàtálá and Egúngún in Nigeria and is living and working as Olórìṣà and Babaláwo in Florida, USA. He is a founding member of the Ìjọ Asáforítifá Òrìṣà Community and promoting Yorùbá culture worldwide. Fluent in the main languages of Òrìṣà worship, Yorùbá, Spanish, Portuguese and English, he is also a well-known expert and researcher of Yorùbá religion in the diaspora. He is one of the few people who know about the Yorùbá art of medicinal tattooing and shares his personal experiences and knowledge with us. This interview is now the third one in an ongoing series, published on this blog. The idea is to get different insights from people around the globe involved in Yorùbá culture. People who contribute in their work to the image of Orisha worldwide. Thank you to Nathan Lugo, àwa dúpẹ́ ooo! Stay connected on www.facebook.com/orishaimage to receive the latest updates. The odù Ìdin Ìlẹ̀kẹ̀ is the sign of the Yorùbá city of Òṣogbo with the Sacred Grove of Ọ̀ṣun. Moussa: Nathan, how did you get involved into the world of the Yorùbá Òrìṣà? Nathan: Hi Moussa. I first came into contact with popular or folk spirituality of the Caribbean as a pre-adolescent. My family is predominantly catholic, like many Puerto Rican families. But folk Catholicism often includes elements of Spiritism. Puerto Rican Spiritism, like other forms of Spiritism in the Caribbean and Latin America, has the influence of African cultural and spiritual retentions so much a part of Puerto Rican culture. This type of folk Catholicism and Spiritism was what I was exposed to early on, particularly by one of my grandmothers. Also, when I was living in the Bronx, NYC, as a child there was a botánica (spiritual supply store that caters to the needs of practitioners of spiritism and Santeria/ Lucumí/ Afrocuban Òrìṣà tradition) right on the corner of the block of my school. Passing by it gave me curiosity. Eventually I went in, browsed through a few books and glanced over the shelves. Doing some reading on my own I began to feel strongly connected to a spiritual tradition of African origin that felt more empowering and culturally appropriate than the Catholicism of original sin and less-than-meaningful rituals. Living for a time in Puerto Rico on and off during summers I came into contact with some very good people that were practitioners of Òrìṣà tradition – the Cuban expression of it. But at that time I had decided that I just could not participate in the ‘misas’, both spiritist and Catholic, that the Santeria tradition requires. I was also never baptized, and I wasn’t going to go through the rites of a religion that I felt little connection to. My calling was non-Abrahamic African-based spirituality. In addition, my interest in the original language and teachings was not something that would be fulfilled with the practitioners of the Òrìṣà traditions that developed in the Americas who had essentially lost the language and only preserved some compromised Yorùbá language retentions. So at that time I made the choice to try to make it to Yorùbáland in West Africa. It took me a number of years before I made some reliable contacts though. Because living for some years in North Carolina I also got into contact with practitioners from the Oyotunji African Village. I later found out that theirs is an eclectic blend of Cuban Òrìṣà practice with neo-kemetic (ancient Egyptian) religion, astrology, Cuban Palo, and their own brand of Spiritism and spiritual masses that they call “Egun Joko”. It wasn’t till I was an adult that I met my olúwo of Ifá, chief Fákáyọ̀dé Fáníyì who is the Àgbọngbọ̀n Awo of Òṣogbo, that I found the person that filled the role of spiritual mentor that I had been seeking. What is the meaning of your Yorùbá name Olóyè Àìkúlọlá Olúwin-Òòṣà? Olóyè means ‘chief’ or titled member of a society. This is because I was awarded the title of Gbáwoníyì Awo of Òṣogbo by my Ifá elders in Òṣogbo, that is a title within Ifá priesthood. In Ọ̀yọ́, among my Ọbàtálá spiritual mentors and elders, I was awarded the title Olúwin-Òòṣà of Ọ̀yọ́ Aláàfin, which is a chieftancy title of the Ọbàtálá priesthood, and especially one with connection to the Aláàfin (king) of Ọ̀yọ́ (ikú, bàbá yèyé). Chieftancy titles can be religious or political, related to the king’s court. My own are religious in nature. Àìkúlọlá is one of the names that were given to me by my elders which means “longevity is wealth.” I have various other names I received during my initiations into Ifá, Ọbàtálá, Egúngún, and even when I received the sacred objects of some of the Òrìṣà that are housed in my personal shrine. It is my impression that it is common today to do the complete Ifá initiation first, learn about your destiny and later do the Òrìṣà your Odù speaks about. All the young traditionalists I met in Nigeria have Ifá, while the elder generation often ‘only’ had been initiated into one Òrìṣà. For Òyìnbó doing ìtẹfá first seems logical, as you do not inherit family Òrìṣà traditions. I was wondering whether this is also maybe an influence of our modern lifestyle. There are so many options today, that one has to rely on Ifá to get an assurance on what to choose. Did Ifá get popular recently? Good question. Some things are a product of Western desires and influences, which I feel strongly we have to be cautious with. Because there is pressure from the West to create a shift in thought and practice that reflects notions and protocols that developed in the Americas. Certainly legitimate work is done for all, so long as one is not involved with individuals that are charlatans. The idea that one can go through ìtẹfá first and then another idóṣù is not new, according to my own teachers. Ìgbín, the African giant snail, a common type of food among the Yorùbá and also an offering for O̩bàtálá. For instance, it is tradition among Ṣàngó priests that after the idóṣù initiation of Ṣàngó has been performed for someone, that adóṣù, the initiates, must not shave their head again. So those that from birth it has been determined that they should also get initiated into Ifá will go through ìtẹfá first and then later the idóṣù Ṣàngó. I have also spoken to some other priests and priestesses that have indeed gone through two or more idóṣù initiations. There are varied opinions on this and other topics. So one has to be careful about making sweeping statements with regards to initiation procedures. By the way, an Òrìṣà initiation that has cowrie shell divination (ẹ̀ẹrìndínlógún) as part of the initiation procedure also brings forth an Odù that will be a life or destiny reading for the initiate as well. It is not just Ifá initiation that does this. But because, as a result of various dynamics, Ifá divination has gotten a high level of prestige in general Yorùbá society most forget about the validity and ancient sixteen cowrie divination system that has been in Yorùbáland for ages. It is important to be exposed to various types of Òrìṣà priests, babaláwo included, as well as the regional variations that exist in Yorùbáland to have a wider more rounded view. Like many people I got to know Òrìṣà traditions from the Cuban perspective. I was surprised about the less secrecy involved in rituals in Nigeria. On my first day in Òṣogbo I was invited into a “cuarto del santo” and witnessing an Ifá initiation. How is the relationship between the apprentice and the elder olórìṣà usually defined in Yorùbáland? I’d like to point out that the idea of the “cuarto del santo” in the Cuban Òrìṣà tradition is not the same as in Yorùbáland. I do not doubt you participated in aspects of an Ifá initiation. But I am certain you were not in the actual igbódù or Ifá grove that is only open to full Ifá initiates. What you witnessed in the room is what is open to just about anyone, in West African Òrìṣà tradition, at least, and in most areas of Yorùbáland. Yes, that’s true. The ceremony in the Ifá grove was done one day before I came in to meet the ìyàwó in the house. The relationship between the elder olórìṣà and the apprentice, called ọmọ òòṣà or ọmọ awo (the latter term being used mostly for apprentices of a babaláwo or ògbóni priests), may depend upon the relative age and context of the parties. Usually the ọmọ òòṣà that train under an olórìs̩à start from an early age when the child can take care of his most basic feeding and hygiene. In this case, the olórìs̩à becomes a type of surrogate parent. And the relationship will usually last a lifetime, even though one may have several other teachers. The ọmọ òòṣà does household chores as well as hands on help during the spiritual work of the priest or priestess as exchange for the training the student receives. There are also trainees and apprentices that come to an olórìs̩à at different ages so the relationship will be a bit different. But there is still the idea of training under a mentor and support for the work done by the one we are training under. There may also be monetary exchange for training, especially for an adult trainee. You speak Yorùbá fluently. In incantations words are brought into a sacred context. This is more than just communication, there is a power connected to the sound – or is it the word itself? In Yorùbá spirituality, the power of the spoken word is paramount. When uttering prayers as well as incantations there is plenty of metaphor and play on words. They reveal and activate the latent power within elements of nature, whether plant, animal or mineral. So you can imagine the high degree of emphasis on oral literature, songs, poetry, chants and the like. How accurate does one have to be in the correct pronunciation using words for oògùn, for medicine, or charms? The belief is that the deities can understand any language. But when it comes to incantations there is a need for accuracy in their rendering. Since Yorùbá is a tonal language with a large number of phonemes, it can cause difficulty in learning to speak it. Incantation is “ọ̀fọ̀” in Yorùbá language, but there are various types used for different purposes such as àyájọ́, ìgèdè, etc. What are these various types of incantations about? There are various types of incantations, and they each have their own names. Some types are the same but simply called by one name among babaláwo and olórìṣà, while others may have an alternate name used by oníṣègùn (herbalists) and/or olórìṣà. Many people know about Yorùbá scarification marks, which – for different reasons – transform bodies. But there is another traditional technique in Nigeria: recently you started to include the art of tattooing for medicinal purposes into your practice. How is this done? Yes, this year I did some training with an olóòlà, or body artist. In Yorùbá communities in West Africa, this person is a trained individual that usually inherited this trade from his family line. He is the one that performs circumcision for babies, as well as facial and body scarification or tattooing. A number of these incisions may be medicinal. I learned this craft on the suggestion and encouragement from a student and friend who is an olórìṣà in the States. He noticed I had a ‘good hand’ when making medicinal incisions. They requested I learn in Yorùbáland the traditional techniques of making permanent body art. I did some training in Ọ̀yọ́, although years ago I received my own traditional Yorùbá tattoos or body art from another olóòlà in Òṣogbo. I also received the traditional tools of the Yorùbá body artist with prayer and instruction as to their care and association with the Òrìṣà Ògún. Incisions known as “gbẹ́rẹ́” (gbẹ́rẹ́ sínsín) are a particularly important and common method of administering spiritual and medicinal preparations among many cultures in Africa, the Yorùbá people are certainly no exception. Once the medicine gets in contact with the person’s blood upon insertion it activates the properties of the preparation. The preparations, rubbed into tiny incisions like paper cuts, are prepared from a wide range of natural materials, may or may not include incantations, and can be for purposes of physical healing as well as spiritual effects for victory over adversaries, protection, prosperity, or even enhancing the power of the spoken word, as just a few examples. 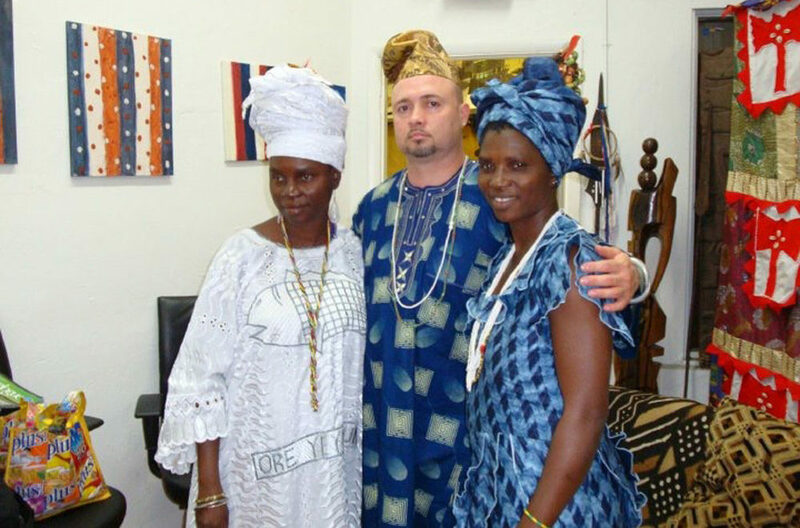 In Broward County in South Florida you run the Ìjọ Asáforítifá, a community for West African Òrìṣà practice. As Òrìṣà worship is strongly connected to music, you produced a DVD entitled “Ọ̀ṣun ni Iye”, a collection of Òrìṣà songs recorded in Òṣogbo, and you also teach oríkì, praise poetry. The Yorùbá traditional way of life is full of all kinds of arts, ranging from singing to tattooing, in honor of the Òrìṣà. Can you tell us about the Ìjọ Asáforítifá? Ìjọ Asáforítifá is a community that I and a number of my ọmọ Awo / ọmọ Òrìṣà (spiritual apprentices) have created for those seeking Òrìṣà spirituality and culture directly from Yorùbáland in Nigeria and Benin Republic in West Africa. We have members in Brazil, Spain (the Canary Island and mainland Spain), Mexico, Venezuela, and the United States. Ours is one that promotes the plurality of the deities we serve in providing betterment for those seeking healing and empowerment. We train budding priests and priestesses with the tools necessary to fill those roles, including chanting of verses of Odù Ifá and Odù Òòṣà (ẹ̀ẹrìndínlógún), songs for the Òrìṣà, foods, kolanut casting, among others. Obì – the four-lobbed kolanut used in communication with the Òrìṣà. My olúwo Fákáyọ̀dé Fáníyì was the one that produced the ‘Ọ̀ṣun Ni Iye’ video. I did participate in some dancing within the video. That type of work is important to document the spiritual traditions and culture. There was a time when even our own Òrìṣà community members in Òṣogbo did not realize the importance in doing so. Among the things that have helped Òrìṣà traditions grow in the west has been documentation and dance and music performance as well as other arts.